With each strawberry plant able to produce one quart of fresh strawberries, a few plants can keep an entire family happily munching the berries for an entire season. Alabama lies within USDA Hardiness Zones 7 and 8, which means that fall is the perfect time to plant your strawberries. In fact, Mary Beth Musgrove, horticulturist at the Alabama Cooperative Extension Service, suggests that you put them out in September and October. Choose a spot in the garden to plant your strawberry patch. It should be an area that receives at least six hours of sun a day. It should also not be in an area where you have grown tomatoes, eggplant, potatoes or peppers and these plants harbor a disease known as verticillium wilt. Test the soil pH. This can be done with a home testing kit or you can take a soil sample to your nearest Alabama Cooperative Extension Office for analysis. You need to aim for a soil pH of 5.5 to 6.8. Ask the cooperative extension agent for suggestions on what types of amendments to purchase to bring your soil to the correct pH level. The agent may suggest adding lime to the soil. Remove all weeds from the planting area. If the area is small, hand-pulling will be sufficient, otherwise you may need to use an herbicide. Nutsedge is a particularly common weed in Alabama gardens. Check the label on any herbicide that you are considering to be sure that it is cleared for use in the strawberry garden. Follow the application rate and all cautions on the packaging. Prepare the soil by loosening it, with the gardening fork, to a depth of 8 inches. Use the fork to crush any large clumps of soil and then rake the area smooth. Pour 3 inches of compost and the amendments suggested by your soil analysis over the existing soil and mix them in to a depth of 5 inches. If you live in eastern Alabama and have considerably sandy soil, increase the amount of compost to 4 to 5 inches. Level the soil with the rake. Sprinkle 8-8-8 fertilizer, at the rate suggested on the package, over the soil. 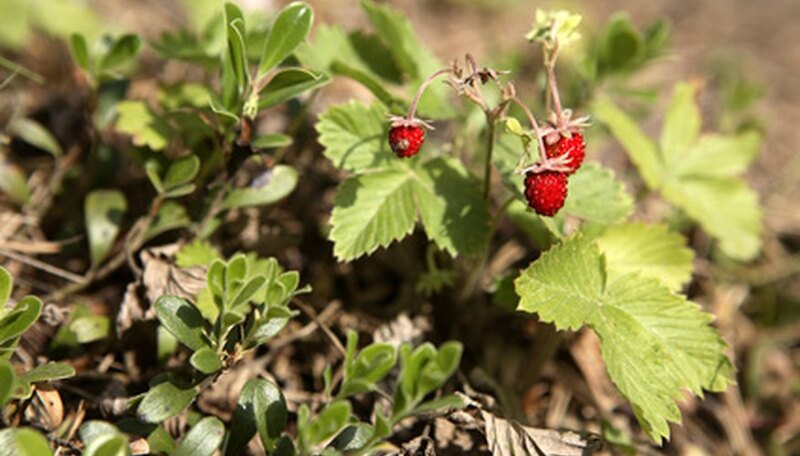 Dig holes that are twice the diameter of the strawberry plant’s rootball. The depth should be enough to where the crown (the area at the top of the rootball) will sit slightly above the surface of the soil and the tops of the roots will be just barely covered with soil. Place the strawberry plants into the holes, spaced 18 inches apart, in rows 3 to 4 feet apart, and pack the soil around the base. Water the area until the water puddles and then provide at 1 to 1.5 inches of water per week. August and September are particularly dry in Alabama, especially in the south, so keep an eye on the soil and make sure it remains moist while the strawberries are becoming established. Add a 1 to 2 inch layer of straw or pine needle mulch around the plants, so that the strawberries won’t come into direct contact with the soil. Mulch will also help to keep the soil cool and moist.